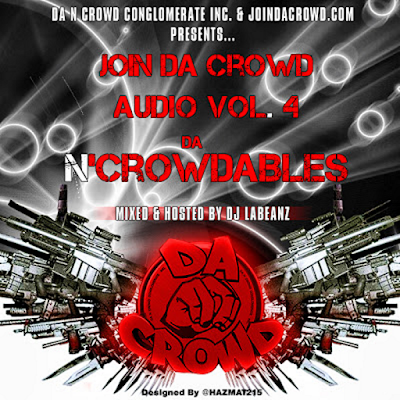 Stream, Embed and Download the 4th installment to the Join Da Crowd Audio series. Hosted by DJ Labeanz and featuring: Amir Driver, B Bondz, Bagstheboss, Fooch The MC, International Gem, Judah Priest, Jus Smith, Knew Era, Lo Keys, Loch, Mav Of Sol Camp, Presice, Spud Cotton, T Blaze and Young FP. Artwork designed by Hazmat. Join Da Crowd Audio Vol. 4 is subtitled "Da N Crowdables" which is a play off the movie The Expendables. Yes, Da N' Crowdables aka The Hip-Hop Expendables. If you've noticed in both movies Sly Stone's character got the meanest and toughest group of people together from all around the world to be a part of his Elite mission. This is what Volume 4 embodies. That whole movement, but in music form. Taking the dopest and nicest lyricist from all over the country, that we've done continuous promo on and putting them all together on one project to set one common goal. Make History..... yet again! Enjoy!! !